Our ability to process, structure and make sense of vast amounts of data is opening up an infinite number of possibilities in every sector, including marketing, logistics, finance and human resources. But we need a new division of human-machine labor to make the most of the analytical revolution. How can we combine the computing power of machines with the best of human intelligence? Josh Sullivan and Angela Zutavern, vice-presidents at Booz Allen Hamilton, claim that advances in technology mean we can now understand any problem no matter how complex it is. Whereas in the past you only had a fragmentary and very imprecise view of your company’s bottom line, nowadays we have access to a broad array of data and tools that can provide a global, detailed vision. This, in short, is the difference between yesterday’s world – when you were satisfied with self-reporting surveys from samples of representative customers – and today’s, where you can track the real behavior of every one of your customers to draw up a marketing or R&D initiative. But is implementing new tools actually enough? 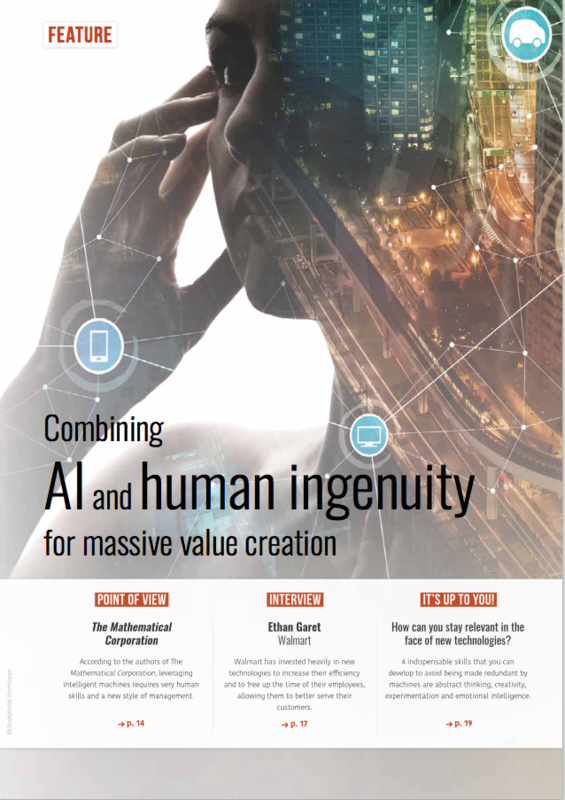 The authors of The Mathematical Corporation argue that making the most of these opportunities is based largely on cultivating new skills and a new style of management. Machines have outstripped human performance in terms of the speed at which data can be processed, managing its complexity and the ability to structure it. You should stay focused on tasks with high human added value and drop tasks that can be automated. For example, machines now analyze and synthesize information from scattered sources more quickly than humans, as demonstrated by the case of Healthmap.org, a website that issues epidemic alerts. The site’s robots were able to spot the emergence of the Ebola virus nine days before the World Health Organization in 2014 by noting the occurrence of keywords on the web. Robots also have the advantage when it comes to aggregating thousands of items of data to detect the operating patterns or faults of a complex system without subjective bias. Merck Laboratories opened a plant in Singapore in 2016 entirely driven by sensors that can detect emerging defects in the vaccine manufacturing chain. Machines in all areas are now better at compiling, processing and storing information than the most experienced experts. In return, they free up time for listening, thinking, persuading and deciding – all eminently human qualities. No matter how powerful the extrapolation and interpolation capacities of algorithms, the ability to generate original solutions is still very much human. Uber’s founders did not create geolocation or online payment applications, and they do not own vehicles or employ drivers. But they did fit these different pieces of the puzzle together to build an innovative transport solution. Tomorrow you will need to connect several galaxies of data together to design innovative concepts, products and services. Whether you are considered legitimate or not will depend on your ability to formulate the right questions – questions that can be understood and subsequently answered by machines. In 2016, the bosses of a chain of hospitals in the American Midwest compiled several years of data on patients who had contracted sepsis in an attempt to reduce the infection’s death rate in its facilities. The doctors asked data scientists to study the differences between the vital signs of people who developed the most severe form of sepsis and others. The data analysis highlighted a characteristic deterioration in the vital signs in the first group that had never previously been identified by the physicians. Yet this discovery would never have been possible without the question asked at the outset. In other words, without humans intervening to pose and structure the problems, machines stay silent!